Join SWEAT Fitness for the second annual Fall Fitness Festival. For the second year, SWEAT Fitness will host a festival at its Conshohocken location. On Saturday, Oct. 21, there will be outdoor fitness classes, food & drink, adoptable puppies and an adult-size bouncy castle. Festival entry is a $10 donation to the Providence Animal Center. Everything else is complimentary. 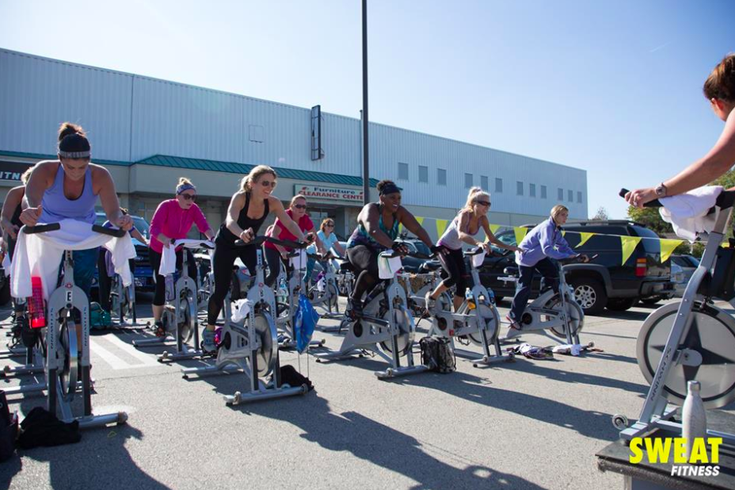 There will be a kickboxing class from noon to 1 p.m. and an outdoor cycling class on stationary bikes from 1:15 to 2:15. Both are free to attend, but you'll need to reserve a bike. To eat, there will be bites from Winnie's Manayunk and pizza from Tony Roni's. Wash it down with pints of Weyerbacher Brewing Co.'s Last Chance IPA, which has notes of tangerine and grapefruit, or relax with a massage from Hand and Stone Spa. Kids can also join in the day's activities by participating in an obstacle course from noon to 1 p.m. or getting their face painted and playing one of the many all-ages games. If needed, parents can take advantage of free child care from 8 a.m. to 5 p.m.
Additionally, festival attendees can win prizes from a raffle. Gift baskets from Yards Brewing Co. and Mission BBQ, gift cards to Conshohocken's escape room Project Escape and coupons for free flower arrangements by Prestigious Petals will be up for grabs. Raffle tickets will be available for cash only. Tickets to the festival can be purchased here.